My name is Christine Marie Bowman. What would be the Korean name for Christine Marie Bowman, for example like Lee Young-Ae, Kim Jung-Min, etc? The Korean name for Christine Marie Bowman would be... 크리스틴 마리 보우먼. But that's not what you are looking for. The Korean believes you are mistaking Koreans with Chinese. For a reason unknown to the Korean, Chinese people insist that people with non-Chinese based names take on a Chinese-style three character name that is somewhat similar to the original name. Koreans in the late 19th century/early 20th century followed that rule as well, which resulted in interesting names for foreign missionaries in Korea at the time. For example, Dr. Horace Underwood, a missionary who founded Yonsei University, took the Korean name 원두우 (Won Du-woo) because it sounds similar to "Underwood". 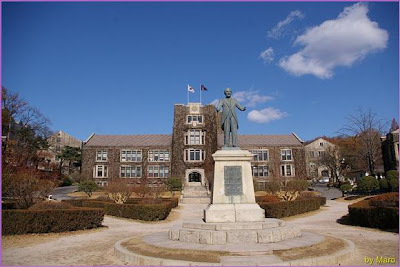 However, the building that commemorates Dr. Underwood at Yonsei University is called "Underwood Hall", and written in Korean as 언더우드 관, rather than "Won Du-Woo Hall" or 원두우 관. As the Korean understands it, Chinese people would use the latter option. Bottom line is that because Korean alphabet is good enough to transcribe non-Korean names fully (although with some limitations,) Korean people do not have the need to insist on a Korean-style three-letter name. If you would like a Korean-style name, you can simply make one for yourself. But such name would be just a random creation without any rhyme or reason behind it. For example, the current U.S. ambassador to Korea is a lady named Kathleen Stephens, who was a former Peace Corps member in Korea during the 1970s. She took on a Korean name 심은경 (Shim Eun-Kyeong) in the 70s, only because the last name Shim is somewhat close to Stephens and Eun-Kyeong was a pretty name. There is no reason why "Katheleen Stephens" must translate to "Shim Eun-Kyeong". Do you want a Korean name for yourself? The Korean briefly described the naming process in Korea here. Pick the letters and go nuts. Reminds me of a story about my aunt. When she was young, she insisted the English version of her name, Yi *** Sun, was "Shirley Johnson." My mother couldn't convince her otherwise. And no, she never went near the US. Korean, through and through. When I was first in Korea, my colleague and I had a very embarassing incident one night at a bar we frequented. One bar tender asked us to make an English name for her. We really put some thought into it, spent about 10 or 15 minutes going back and forth, and finally agreed on what we thought was an appropriate name. When we gave it to her, her face turned bright red in embarassment, and our Korean friends just broke down in uncontrollable laughter. Turns out that this particular name, when pronounced in Korean was, shall we say, a quite naughty slang word. After that, I have never again made a name for a Korean, no matter how much they beg me. Our Korean friends made me and my colleauge some Korean names years ago using two methods. My Korean name was chosen because it sounds similar to my Western name: 길수 / Chris (it was only later that I learned I'd been branded me with a "country-boy" name), whereas my colleague's Korean name was chosen to be a popular Korean talent whom he resembled. "The Korean believes you are mistaking Koreans with Chinese. For a reason unknown to the Korean, Chinese people insist that people with non-Chinese based names take on a Chinese-style three character name that is somewhat similar to the original name." During my four-year stay in China, I never heard of any foreigner being forced to adopt a Chinese name. I and many other Westerners did have alternate Chinese names for fun, but they were rarely used. Business cards bear transliterations of full names just like business cards in Korea. One interesting difference between Korea and China in the use of names is that most Chinese who have regular contact with Westerners use English nicknames because they think Westerners can't handle Chinese names. As Koreans are more likely to use their real names with Westerners, I have a greater appreciation of the beauty of Korean names. The international school where I taught in China had a policy of imposing English nicknames on Korean and Chinese students. They had tried to do the same with Japanese students but backed down after parent protests. When I joined the staff, I complained that the policy was discriminatory, and it was officially dropped although in practice most Korean and Chinese parents opted to have their children called by English nicknames. I chose the name 믕 수 병 while I lived in the ROK and was in the US Navy, although one of my favourite words in Korean is 각선미 (which I think would have made an awesome name if you got to pronounce it with a slight lisp of the lips and didn't mind being thought gay, not that there's anything wrong with that. That's why the Korean is not an expert in the affairs of China. However, the Korean also has some work experience in China, and it seemed that the non-Chinese around the Korean all adopted the Chinese-style three-letter names. "Forced" seems a little too strong, but it apppeared that there was a certain amount of pressure. Yes, I prefer when Koreans use their "real" names, rather than a made-up English name that will probably change several times anyway. Last semester a teacher said "Call me Silver." Um, no, I'm not calling a grown woman Silver, but thanks anyway. I think those uninitiated to the Korean language can handle Korean names at least as well as Koreans handle "Rachel," "Zach," or just about every other polysyllabic name that may or may not have tricky sounds in it. Get us some credit, and give us the chance to learn your names without making up some ridiculous alias. Another colleague named himself Francisco. Christ. The Korean met a Taiwanese who went to a similar process and chose "Eggbert" for his name. Seriously. Another person, a Korean who was studying in the U.S., chose "Pep". Coincidentally, some of my students in another teachers' conversation club are picking English names. The (Korean) teacher gave them a huge handout with a bunch of names and their translations. Among the names on the list: Rambo, Pooky, Bambi, Apollo, Baldy, Chunky, Scoop, Spotty, Sniper, Kitty. It's a mixture of animal names, women's names from the American South in the 1860s, and insults you call the kid nobody likes, with a few normal names thrown in. I'm gonna have to search and see if this list is in wide distribution. My school in China gave all the foreigners Chinese names, supposedly because it made things easier with the immigration office, opening a bank account etc. Usually, the names were chosen to sound close to the real name of the teacher, and the characters chosen were the more flattering meaning of those sounds. For example - "David" would be changed to, "Da Wei", "Shannon" to, "Xia Nan" etc. The way it was explained to me, Chinese is extremely difficult to pronounce for an English speaker and a mispronunciation of someone's name can cause uncontrollable laughter and/or offense, so it's just easier for them to use western names when dealing with those unfamiliar with their language. Japanese and Korean pronunciation are the one thing about those languages that's easy for an English speaker. I don't think either language has sounds that we don't also have in English. Maybe the Japanese "tsu" counts, but not really. No tones. Foreign Sumo wrestlers in Japan have to use Japanese names though because the old wooden display board isn't built with foreigners in mind. One does need a name written in Chinese characters to for certain transactions, and that name is usually a close approximation of one's English name. It can be more than three syllables. Mine was. My long full name sometimes got abbreviated on Korean forms in which the name entry was limited to five syllables or less. It was explained to me by a 35-year resident of Korea that he had to pick a Korean name because in the past, any sort of official documentations could not handle his name-Hangeulized or not. He has had a Korean name that is officially recognized for more than three decades, but was recently told that it was no longer valid. He's had to change his driver's license and other cards. I studied in China and we were all given Chinese names. Unfortunately I was given a boys name which is only two characters- names in China can range from two to four characters. No one in the world can pronounce my English name as it's really rare German- only Swedes still seem to use it! Chinese students who make up names themselves tend to make wacky choices- I once taught in a school in the middle of nowhere and signed books for three kinds called: Rock, Steel and Beyond. Another popular name is Fanny. My understanding is that all Koreans and Japanese kids have Chinese characters for their name. Would suggest that non-native speakers always ask a trusted native speaker to help them out. As well as watch TV and films and get a feel for the culture and naming practises. i have a quick question. my name is mitsuko (japanese) and i was wondering how that would be written/pronounced in korean. i had some korean friends and they had trouble pronouncing the "ts(u)" sound. they always said "chu." My first name is Ellen (Ehl-Lun), does this mean my name would be 엘런 ? Ok, I am working on my Korean name. I like 이진호 at the present moment. I never really put much thought into naming conventions in Korea. When I first met my wife some 35 years ago, her engrish was on par with my Korean, A couple of verbs that were interchangeable and a few nouns. She had a little trouble with the pronunciation of Russell, too many R's, S's, and L's in one word. She gave me the name 길수 and I have been answering to it ever since. A few years ago I decided I really needed a last name to go with it. I chose the name of a person for whom I had great admiration and respect, my mother-in-law 박춘봉, 그리고, 네이름이 박길수 입니다. Although she passed away before I made this selection, I believe she would have been fine with my choice. Forgive my poor spelling in Korean, I'm trying. what is my korean name? My name is Rosecel robles. My mom decided to be "creative" and named me Xia. I am not asian and she chose to pronounce my name as if you were saying "ick-see-ya". I'm currently trying to learn Korean using some material my school gave me to use on my own time and I want to move to Korea in the future. How would you pronounce Xia in Korean?? In korean Xia is 시아. Look for singer named Xia Junsu and you'll know how to say it. My name is Kalidha parveen what would be my correct korean name?? My name is Aaliyah what would it be in Korean? You could write it phonetically as 아리야. Even with all this in mind, is there any way of "translating" my name into Korean? I'm Rachel (usually spelt 래이첼) and... well, to be honest I'm just sick of people not people able to pronounce my name. There are no less than three sounds in it which are almost impossible for Koreans! Do you know if there's any common way of translating "Rachel" into Korean? For example, I have a cousin called Grace who is commonly called by our Korean relatives as 은혜, which is pretty common amongst Korean Christians anyway. Sheep aren't exactly a common thing in Korea, so there's no use translating the meaning (which is "ewe"), and my middle name is Anne, which then becomes either 안, 아나, or 은혜, and I already have two cousins called 하나 and Hannah. I'm sort of considering transliterating another pronunciation of my name, for example from the original Hebrew, which would render it something like 라켈, or use my Gaidhlig name, Raghnaid (Gaelic is my first language), which would be 르닟... I don't really like the look/sound of either of those. she who will hopefully soon no longer be called 래이첼. Since Rachel means "ewe" that makes it really easy actually. Yoo is a very common sound in Korean. One of the top 100 korean girl names is Yoona, spelled 윤아. Im Yoona is a south korean singer and actress: https://en.wikipedia.org/wiki/Im_Yoon-ah . 윤아(Yoona) is like a combination of Ewe and Anne spelled backwards, Ewe ennA. Get it? Ewe-ennA...Ewenna...Ewe=Yoo, nna=na...Yoo na...Yoona. Your last name is Hay, so that would be 해. All together your korean name would be 해 윤아. Hay Yoona. My name is a word (Harmony) so would my Korean name just be Harmony in Korean? my name is Ma. Rhyanne Tagulinao, what is my korean name?